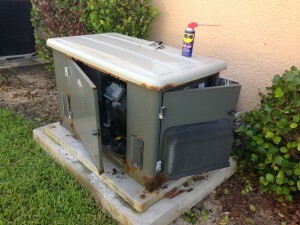 Looking for generator repair in SW Florida? West Coast Generators can repair your non functioning generator. If the engine doesn’t start or it doesn’t produce power we can diagnose and repair the problem. We cover Lee and Collier County. Maybe you have a severe rusting issue like the generator photo below? We can replace your generator case! West Coast Generators started servicing this unit recently. By the looks of that unit the prior company did a poor job at maintaining the unit. This unit also had the wrong oil filter and the wrong type of oil as well. There were many problems with this unit but all are corrected and it runs smooth and steady, ready for a power outage! So if you are in need of any generator repair just give us a call and we will be right out to get your generator running in tip top shape! We have very competetive pricing and great service!